Simple lost and found alerts! We are a new Dublin-based lean startup. We are a small team and are focused on delivering a great service. We hope everyone finds our service useful and easy to use. Please feel free to give us feedback on anything at all. We found that many people find it hard to return items as they don't know how to contact the owner. 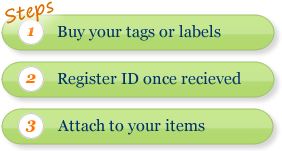 Our labels and web site allow people to return items with ease. After reading about Lean Startup and attending a seminar we decided to take the plunge and create our minimum viable product. So here we are!